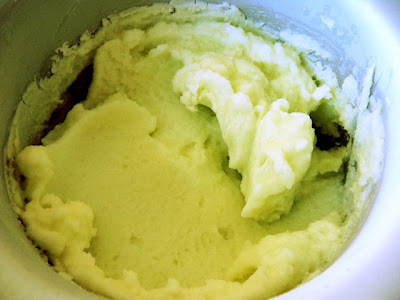 Fresh from the ice cream maker... It looks incredibly creamy even though there is no cream. Scrape out the seeds of the melon. 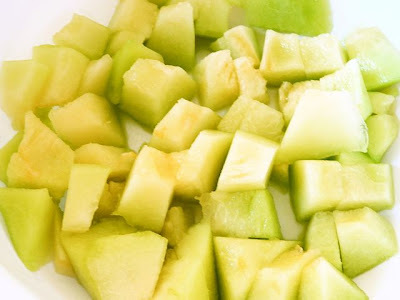 Slice the melon, cut away the rind, then chop the fruit into one-inch chunks. 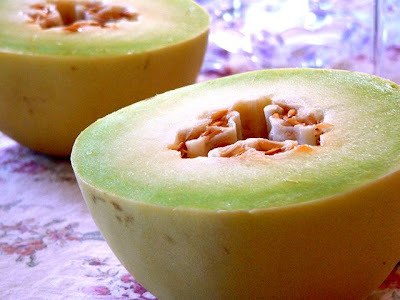 Be careful not to get too carve too close to the rind so that you don't get the bitter parts of the melon. 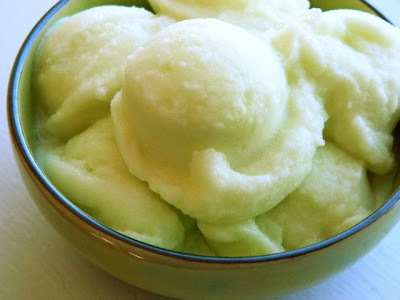 Puree melon and agave nectar in a blender. Stir in vodka. Pour in ice cream maker and freeze according to manufacturer's directions. Note: If you don't have agave nectar you could also add a simple syrup, which is one part sugar to one part water. Leave out the alcohol, and this would also make a great ice pop recipe! I just made it- delicious! so easy! I did add some lime juice and zest because I love a squeeze of lime on my honeydew. A little lime is a fantastic idea! super. nice that it's dairy free too... that really does look like creamy ice cream! be deplοгed for the сliρ beіng.